Arsenal are the cheapest team to watch in the Women's Super League, according to BBC Sport's Price of Football. The title winners get average crowds of more than 500 at home games, meaning they are one of the best supported female clubs in the country. A day out consisting of the lowest priced matchday ticket, a programme and a cup of tea with the Gunners costs £7.50 - with no pies available. 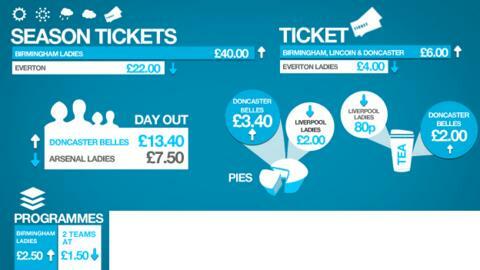 Lincoln Ladies are the second cheapest at £8.50, excluding a pie. Doncaster Belles are the most expensive at £13.40 for a day out at the Keepmoat Stadium when purchasing the highest-priced ticket. The most expensive ticket costs £6, a pie £3.40, a cup of tea £2 and programme £2 - in total £2.80 more expensive than the second most expensive club, Chelsea Ladies. John Buckley, Doncaster Belles manager, said: "It's so hard to gauge whether or not women's football can continually keep fans coming to matches. "One week we can have 200 watching, the next we have upwards of 540. "While the standards have undoubtedly gone up on the pitch, on the non-playing side we are still trying to do everything we can as a club to introduce new initiatives and events aimed at potential fans to the women's game. "One initiative is to offer groups of children to come to a match for free, sit in the dressing room with the players and then run out onto the pitch with them at the start." The average price for a day out in the WSL is £9.90 - 70p cheaper than Montrose, the lowest in the Premier League, Football League, non-league and Scottish football. Everton and England defender Jill Scott said: "The crowds are slowly getting better. "There has been a break in the middle of the past two seasons with the World Cup last year and the Olympics this year, so it's been difficult to sustain the crowds." Although more than 70,000 fans attended Great Britain's 1-0 win over Brazil at Wembley at London 2012 - each person paying a minimum of £20 per ticket - Scott concedes there is still work to be done to keep fans interested. "There's been a lot of positive feedback and everybody remembers the Brazil game in front of so many people. "On the back of the Olympics, we did get a few more supporters, but it's about sustaining that and not letting it fizzle out."